Saw this heartwrenching photo last week of a backhoe ripping down the 80+ year old Lake Street tower at the north end of the Chicago Union Station complex. Lake St was in service until 2005 with both a big US&S Model 14 interlocking machine for the local interlocking and a large panel for the entire southern end of the Union Station complex. While disused since then Lake Street was in amazing shape and in a very secure area. Well so much for all that. Perhaps it was attracting too many railfan photographers or perhaps Chicago is following through with some old pipe dream plans to cover the tracks in this area with either a park or parking lot. Whatever the reason the City of Chicago has lost an important historic artifact that could have been preserved as a museum at the tri-point of the Chicago river. Hopefully the interlocking machine and model boards were preserved before the tower was ripped down. Fortunately the tower at the other end of the Union Station complex, Jackson Street, is immune from demolition as the new Post Office building was literally built around it in the 1990's. Unfortunately its view of the city is now severely limited. This past year saw the destruction of my beloved Huntington Ave interlocking by CSX C&S forces as they needlessly re-signaled a 261/CTC line without pole lines just to spite the memory of the B&O in its home city. However I was provided with over 6 months of lead time to get out and get all the photos and videos and since I needed to make a proper tribute to the signals that have given me so many years of enjoyment. I felt it fitting to show off the eastbound CPL dwarf's full range of emotion. The most difficult indication to capture was naturally Medium Approach Medium which I only managed to snag with a cell phone camera a week before the signal was retired. Farewell old chum, your approach lit light show never failed to brighten my day. While I have now covered most of the major METRA operated interlocking towers in the Chicago Area in my ongoing web series there are still a few left in the bag and one of these is the partner in crime to the recently covered METRA Tower A-2 at Western Ave. Pacific Junction is a 4-legged junction on the old Milwaukee Road passenger network as it approached Chicago's Union Station. Logically it is composed of the Milwaukee Road main line to Milwaukee running North-South and the main line across Illinois splitting off to the west with a small freight spur heading west to the Chicago River industrial district. In practice the junction looks like a 90 degree crossing with connector tracks cutting each of the corners. 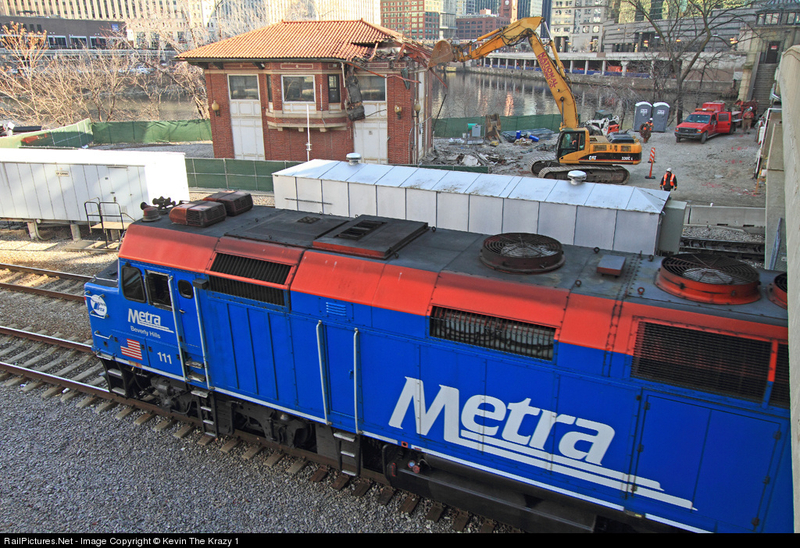 Today the Chicago commuter railroad provider METRA owns both the interlocking plant itself and the tracks south to Chicago Union Station. All other lines feeding the interlocking are owned by Canadian Pacific which was previously handled through its SOO Line subsidiary. Today the line to Milwaukee comprises the CP C&M Subdivision while the line to the west is the Elgin Sub and together they host the METRA Milwaukee North and Milwaukee West commuter services. On the ground Tower A-5 has a very interesting layout with a three track main line running north to west via a sweeping 90 degree curve and another two track main line splitting from the 3 track line to run north. The eastern two-track freight spur used to split from the western route of the 3-track line, crossing the north-south line via a diamond crossing, but the diamond has since been removed leaving access to the freight spur and wye track via the curved connections to the north-south line. 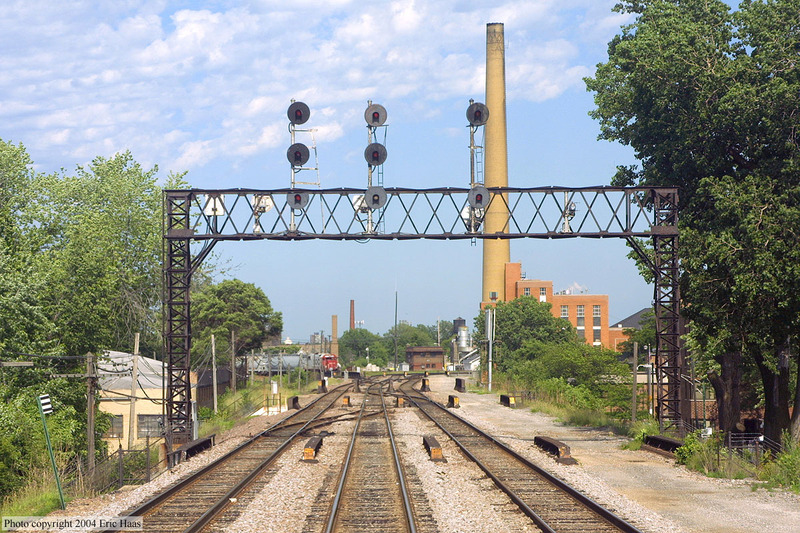 Here in a photo from the Railroad Signal Collections site we see the A-5 interlocking plant from the west with the tower visible far in the background. While technically two of the three Elgin line tracks diverge into the C&M line, the weak route signaling used on the line offers each of the two rightmost tracks (tracks 2 and 3) a "Straight" route through the plant. In the photo the track #2 signal is displaying a lunar white Restricting indication due to another train running ahead in the same block. Previously the former Milwaukee Road lines utilized "bottom yellow" Restricting, which is derived from the older practice of having a subsidiary signal for "call-on" indications. This is why the track #3 signal has the gap between the lower and upper heads to differentiate R/Y Diverging Approach and R/*/Y Restricting. Use of Lunar White in place of bottom yellow removes this potential conflict. A 4th siding track also used to join the junction from the right, but this has been removed although its signal on the gantry has only been partly so. 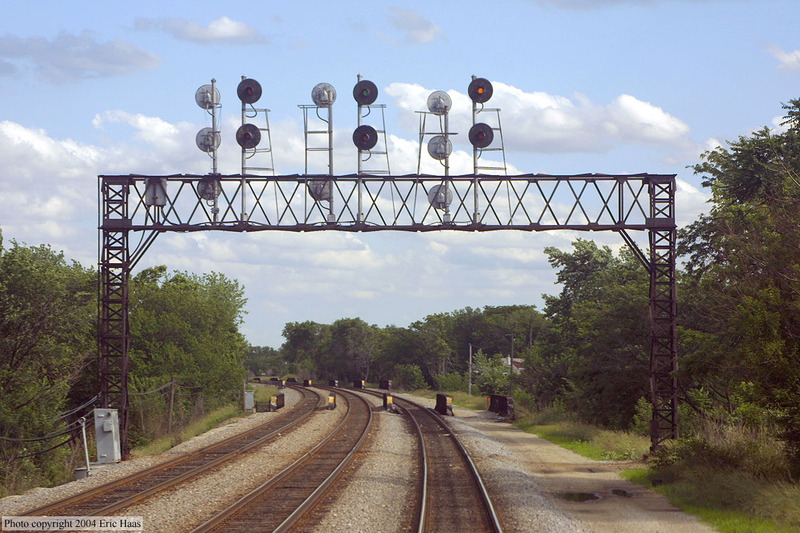 Here we see the rear of the northbound home signal gantry for Tower A-5. A three headed signal is provided for each track as all three are provided with diverging routes. The right of way clearly had provision for 4 tracks, but as the model board no longer shows any indication of a 4th track I cannot comment on the original layout of the tower as I do not have an original diagram. Both home signal on the three-track route are provided with absolute exit signals controlled from tower A-5. The use of exit signals is an easy way to implement bi-directional operation with simple relay based interlockings as it simplifies a lot of the logic by not having to check traffic flow status when setting up a route through the plant. Also note the 72L signal for track #2 which lacks a middle "diverging" head despite protecting the 63 switch which can send trains either north or west. This indicates either that both routes are signaled for the same speed and thus do not need to be differentiated or that a diverging move would need to be made under a Restricting indication.